Dorothy really believed it when she thought that there was nowhere else but home. But that's only because she actually got to go to Oz! We suppose she may be right that there is no place like her home, but we wouldn't mind at least having a nice little vacation home in Munchkinland or even a cozy condo with a great view of the Wizard's palace in Emerald City! Aside from making sure you keep your windows closed so that you don't get kidnapped by a flying monkey, we think that Oz would be a fantastic place to live in! We've been to Kansas before and we didn't hate it, but we also didn't get a chance to find a talking lion or any kind of cheerful, goofy scarecrow that just wants a brain! Get ready for your trek down Oz's famous golden lane wearing this Women's Adult Dorothy Costume! You'll look iconic in the blue and white gingham dress with its faux buttoned pinafore and retro white blouse. You'll love the full sleeves detailed in dainty blue brick-a-brack. It's just the dress to keep you looking endearing during your adventure. So, it looks like you're ready to be picked up for your trip over the rainbow! Better check the weather radar. If you want to polish off your look add anklet socks and a pair of those red slippers (because it just wouldn't be the same without them! ), and a basket for Toto. 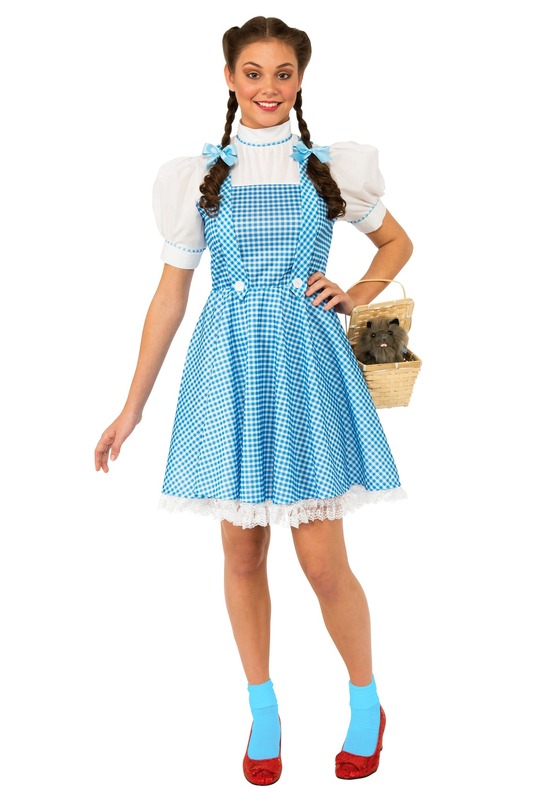 Recruit friends to be the Scarecrow, Tin Man, Cowardly Lion, and Glinda for a fun group theme. Whether you're heading out from Kansas or New York City, when you're wearing this classic costume, you're sure to be headed to a brighter, more colorful world! Although I liked the overall dress, the sizing is a bit off. I normally wear a size 10-12 and wear a med/large. I ordered a large and it was too big. I then tried to order a medium but was told it was not a medium but a "standard" size. I ordered that one but it was much too small! It was like a size small. My arms didn't even fit through the arms. I would say that the standard size is more like a size 6-8. This is a nice costume for the price. The dress is not form fitting at all so I added a belt - the dress, as it was, made me look 2 sizes bigger than I am! The hair ribbons are just plain blue ribbon not blue and white like the dress. And I also added a crinoline under the skirt - It helped with the fit a bit. I am wearing this costume and I am not unhappy with it. It just needs a few extra touches. I ordered the large because of the measurement guide. The large ended up being a size 14-16 dress size which does not match the measurement guide and it didn't say anywhere that it would be a 14-16 dress size. I would have not gotten the large if I knew that. I'm usually closer to 8-10 dress size so it was really big. I ended up safety pinning the waist about 10 inches in. I safety pinned the shoulder straps about 5 inches in each. I safety pinned the arm bands about 2 inches in each. It ended up looking okay once I got it to fit right with all the safety pins. Really nice dress! Well made. I bought this for Halloween this year and I absolutely loved it! It was really high quality in my opinion. Another review mentioned the straps being long, in reality they aren't that long. I mean the were but I simply just adjusted them by sewing it to my size. I'm pretty tiny, 5'0 and 96 pounds. If this fit me and was easy to fix. It'll fit anyone honestly. I received so many compliments on me. The petticoat, the underlining of the dress was very itchy but please, not that itchy. I just wore shorts and a cami under. Besides those two flaws, it was perfect! I looked awesome, just like Dorothy. I also got the ruby slippers and toto which made it more awesome. As some of the other reviews state, the tulle underneath was incredibly itchy. I tried it on and had a red rash around my abdomen within minutes from the seams of the tulle. If you wear something underneath the costume you will be fine. Also as others reviews already touched upon, I thought the straps on the dress were an awkward length. My wife wore this and it was great!